Researching the past pupils of the School endlessly uncovers interesting stories – only to be expected given the large numbers we are considering from 1788 onwards. 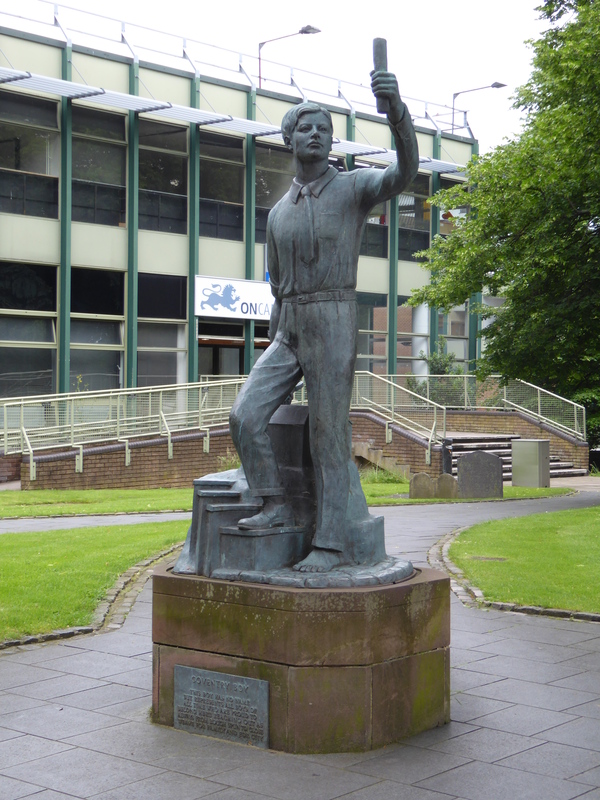 Recently, I discovered that the father of Celia Bentham (1927-1963, at school 1937-1944) was Percy George Bentham, a sculptor of renown who studied at the Royal Academy. As well as her father being a sculptor, Celia’s brother, Philip, also became a sculptor. Born in 1913, Philip studied at the Central School of Arts and Crafts and also at Kennington School of Woodworking but he began his work training with his father. “is a model of a young man standing holding up a roll of paper in a heroic pose like a king or knight holding aloft a sword. But this is no ordinary piece of paper; this is his ‘Apprenticeship Certificate’. He has passed the City and Guilds Exam and now can become a member of the Coventry Freeman’s Guild; this is his ticket to a new and better way of life. 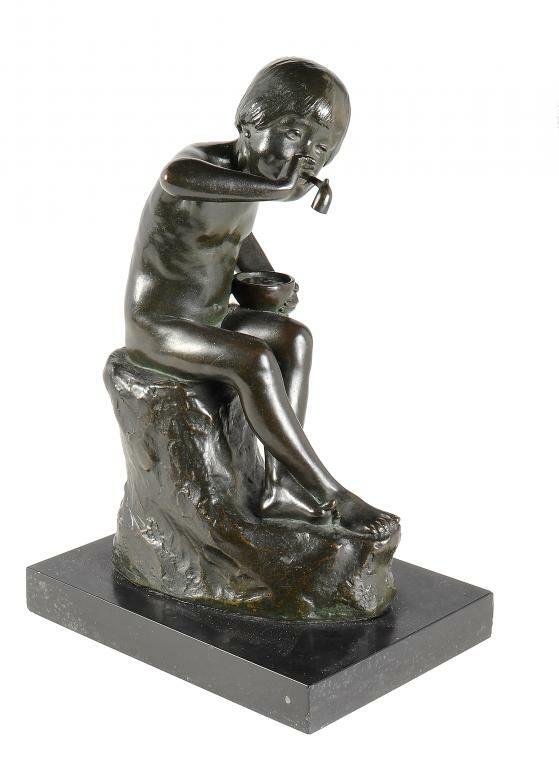 In one of those odd twists, when Alfred Harris of the Coventry Boy Foundation, who commissioned the work, visited Philip Bentham ’s studio, he saw there the plaster sculpture entitled ‘Fisherman and Nymph’ which Percy George Bentham had exhibited in 1922 at the Royal Academy. In a sort of Gillette move [‘I liked it so much I bought the company’] Harris got the Foundry to cast it in bronze and then presented it to the City Council to be put on a small island in the lake at Coombe Abbey Country Park in 1968. 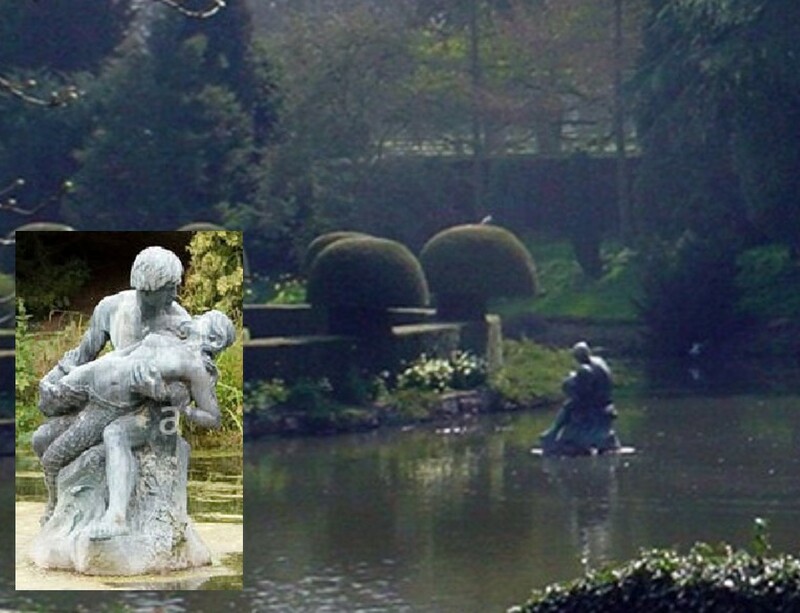 Pictured below is the statue in its place in the park and (inset) a closer view. So Coventry is a two Bentham city. 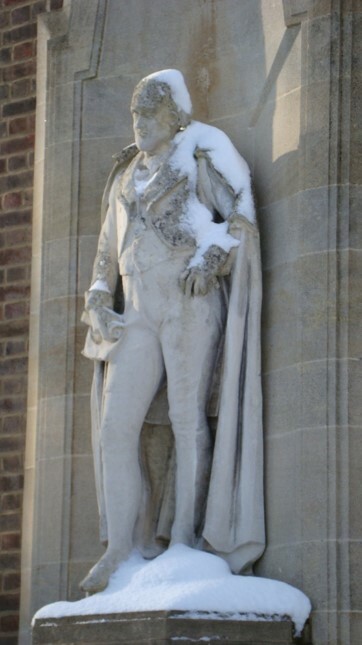 Another sculptor indirectly linked to the School is Charles John Collings who married a former pupil, later teacher, of the School. Glorying in the appellation Melora Fogwill Goodridge, this former pupil became Mrs Collings in 1881. Her new husband was described as a stone merchant in 1891 but as a sculptor in 1901. In 1910, when the Collingses left UK for Canada, the travel documents describe him as an artist. It is in this category he is more widely known, producing the most exquisite watercolour paintings. 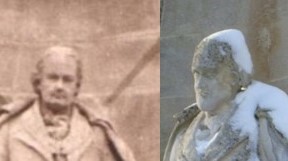 But whereas Bentham pere et fils and Charles John Collings are sculptor/artists connected to the School by courtesy of former pupils, it is time now to turn to former pupils who themselves practised the art of sculpture. Christine Cooper nee Duncan, pupil c1912-1918, later founded the school magazine, Machio, in 1924. It is fitting, therefore, that in Machio 1958, we learn that she had exhibited a sculpture in the summer exhibition of the Society of Women Artists, Royal Institution Galleries, Piccadilly. Not a sculptor by profession but an English teacher, her artistic endeavours are perhaps the more creditable for that. Juanita Homan, nee Page, who is a professional artist, left the school in 1948 and went to Kingston School of Art. From there, she left to study sculpture in Paris with Ossip Zadkine a Russian who lived in France from 1910. 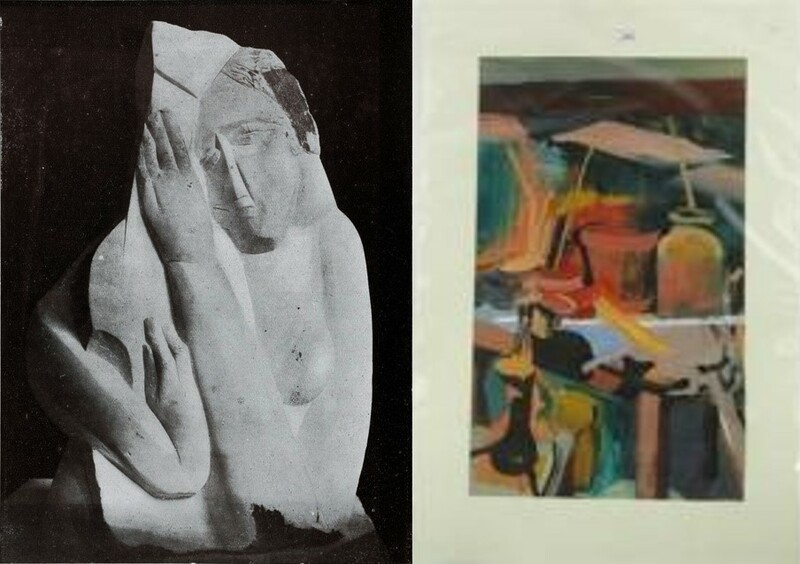 Perhaps Zadkine’s style, influenced by cubism (left), is reflected in the piece of Juanita’s work we see here (right). On her return to UK, Juanita studied at the Camberwell School of Art, the Sir John Cass School of Art and, when her children were older, she attended Goldsmiths to read for an honours degree in Art & Design. Sculpture as an art form is not readily practised as a school subject for obvious reasons. Manhandling a great lump of stone into the School art department for students to hack about – sorry, craft into an art form – is unlikely to be high on a priority list. However, many long-established schools have statuary of various kinds that might be studied by art students. A recent post looked at the work of Joseph Cribb that can be found at the School but the one we turn to now connects not only with the school’s history but with the time of year: Hallowe’en. 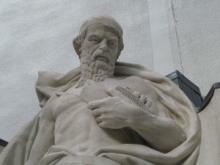 The statue of the Institutor, Ruspini, was crafted by an unknown hand. At least, it is unknown now although presumably not unknown at the time. Unfortunately, nobody at the School thought to make a note of the sculptor’s name (but see footnote). It was originally placed on the gable of the Centenary Hall at Clapham and it became a thing of derring-do for the older girls to scramble about in the rafters and reach out and pat him on the head before they finally left the School. Naturally the School forbade such dangerous activities although if they had used a kind of reverse psychology, it might have been better to make it compulsory under supervision. That would have killed it off completely. Once something is legit., it loses all desirability as an act of (minor) rebellion. 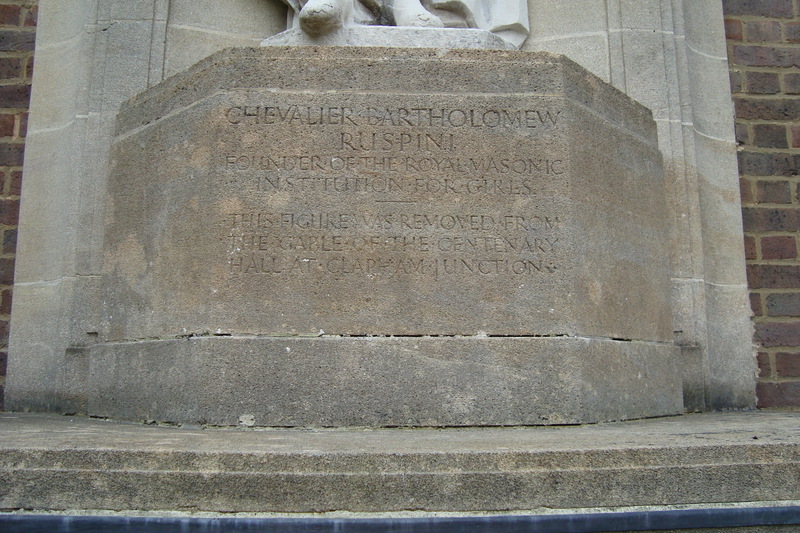 The stone plinth under the statue’s feet today records that the figure had originally been at Clapham Junction. 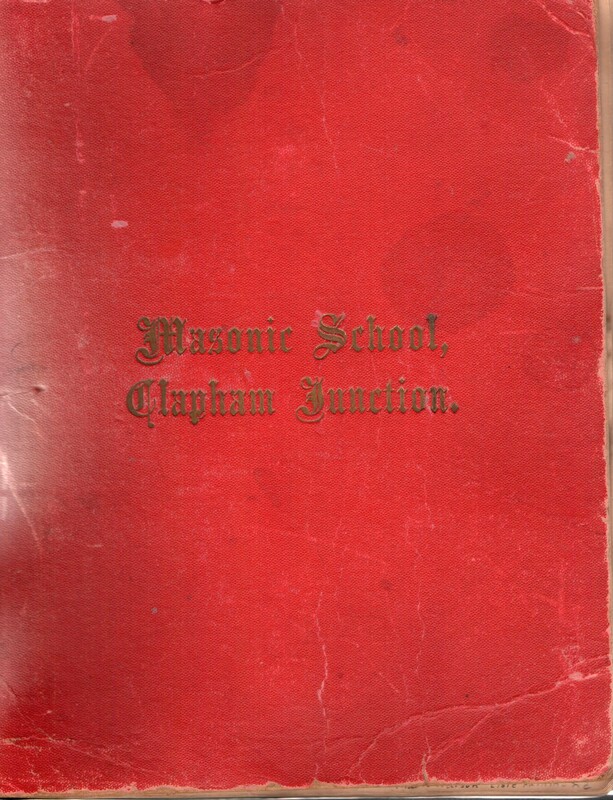 Only the lodges at the two gates of the school at Clapham remain as the rest was demolished by the Peabody Trust who had bought the site after the School had moved on. 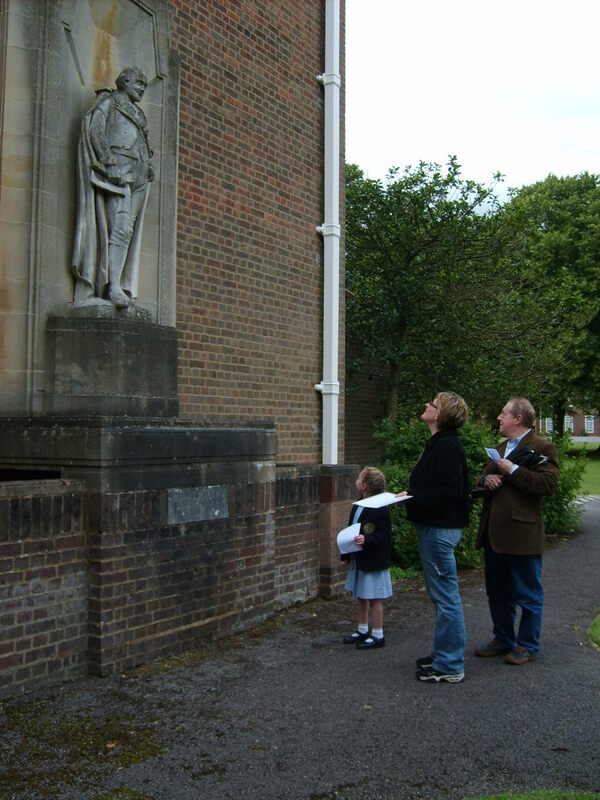 However, the statue and the foundation stones of (probably) the Alexandra Wing built in 1888 were preserved and moved to Rickmansworth to be integrated into the new school. As the school had to be made ready for the girls long before the Clapham site was demolished, the items could not be fully integrated and, instead, were placed at the eastern exterior wall of the Chapel. There is little chance of the girls wanting to scramble up and pat him on the head as there is nothing to scramble up on. They would have to bring ladders and either commit the act in daylight or use torches. This kind of spoils the illicit quality especially given that originally the Headmistress and the Matron both had their living quarters with a clear view of the Chapel! Long before foot could be set upon rung, there would have been the authoritative tone of enquiry (“And just what do you think you are doing?”) that sets all schoolchildren’s hearts quailing. So Ruspini’s coiffure has remained untouched by hand since 1933. But his face has not fared so well. Exposure to wind and rain resulted in damage to the lower part of his face requiring some genioplastic surgery. Not, in this case, by a plastic surgeon: more courtesy of a bucket of mortar. His chin had to be remodelled with some judicious concrete resulting in a somewhat larger lower jaw than he had originally – in stone as well as in life. This composite image of the face before and after the remodelling may give an idea of the change. Perhaps this is what gave rise to a little story, told in darkened dorms by some little girls to frighten other little girls into squealing with horror. It was said that, if you watched the statue at midnight on Hallowe’en, he changed legs. Instead of resting on his left leg with his right leg forward, it was his left leg that projected. A daft little story, easily dismissed as every photograph of the statue shows, quite clearly, the same leading leg. Needless to say, the cause of this was the fact that the slide image of the statue being viewed was simply being viewed from the wrong side! Although it does make you wonder about the expression ‘no stone unturned’. 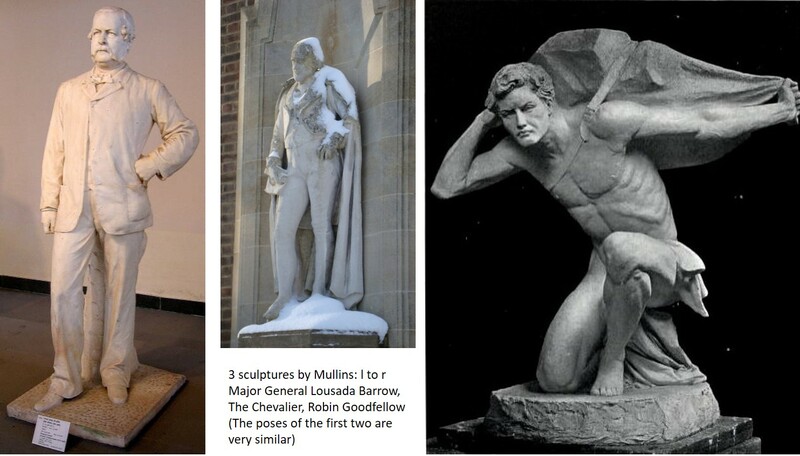 Subsequent to this being written, the information was supplied that the sculptor of the Chevalier statue was Edwin Roscoe Mullins who had studied at both the Lambeth School of Art and the Royal Academy. Born in 1848, for the last decade of his life he was in poor health and died in 1907. As http://www.victorianweb.org/victorian/sculpture/mullins/index.html informs us, he made his professional debut in Vienna & Munich before coming to London in 1874. This Ginnett is the father of Louis Ginnett whose art works also adorn the School What goes around comes around? 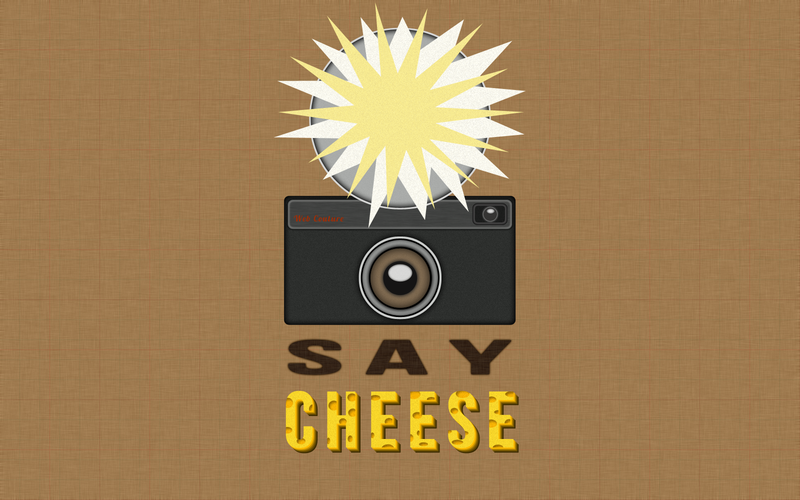 This familiar phrase originated when early photographers, in an attempt to engage the attention of a child subject and enable a clear photograph to be taken, would have a prop held above the camera to focus attention. “Often, these props were toy birds that would flap their wings or warble. 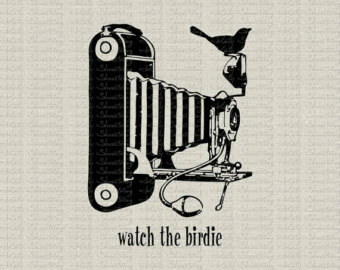 In a time when children’s toys were simple rag dolls or marbles, such a toy would be a marvel.” http://grammarist.com/phrase/watch-the-birdie/ Given today’s advancement in technology, the “phrase watch the birdie is now usually used for comic effect” (ibid). 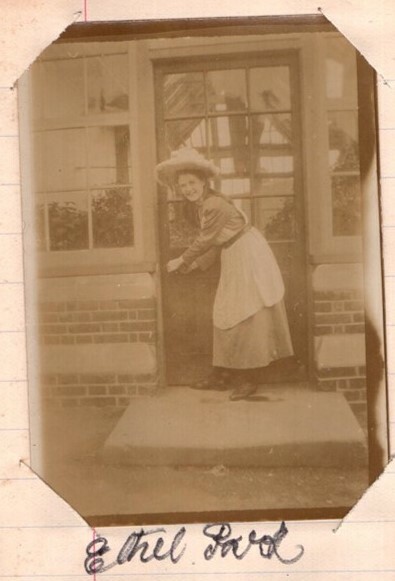 It is not known whether this phrase, or something similar, was used in 1909 by Ethel Cossham Park to capture the attention of her friends at school but she did succeed in capturing their images which she placed in a home-made album. In later years, she passed this onto another pupil, Janet Gaylor (1941-2013) and, after Janet died, it was donated to the School by her estate. 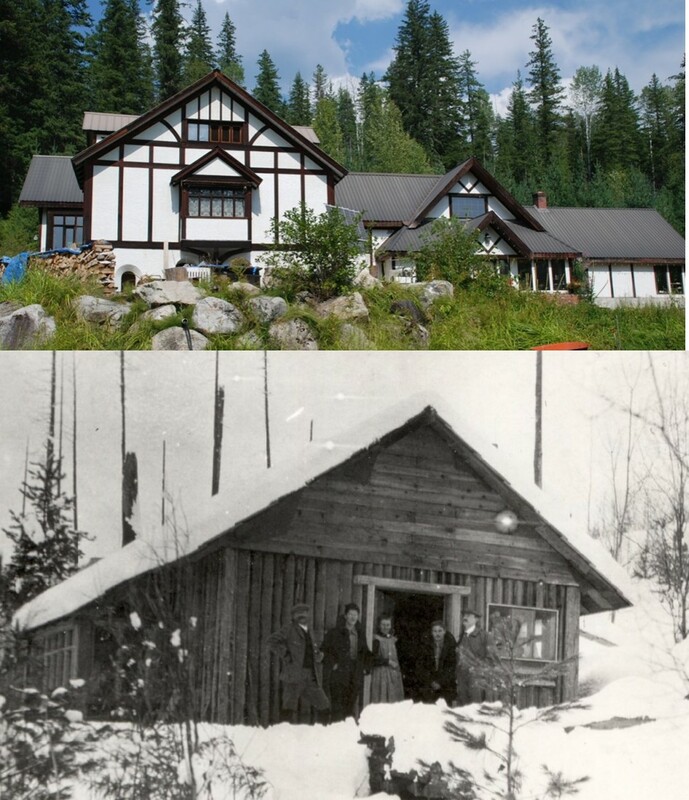 Ethel (1892-1979) and Janet were technically two generations apart and their only connection was that they had both been pupils of the School. It is a wonderfully visual way of demonstrating the history of the School through its pupils. 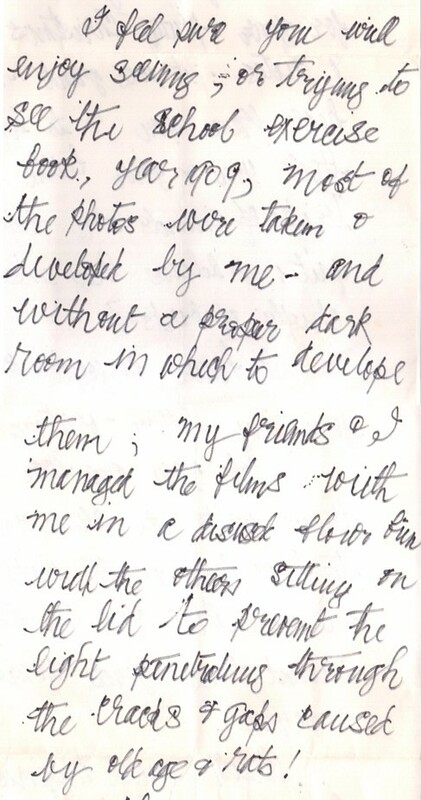 Ethel was not the only pupil who recorded her contemporaries and whose efforts are today held in the Archives. Alice Lilian Kent (1893-1985) was a contemporary of Ethel and she too preserved her photographs in an exercise book. 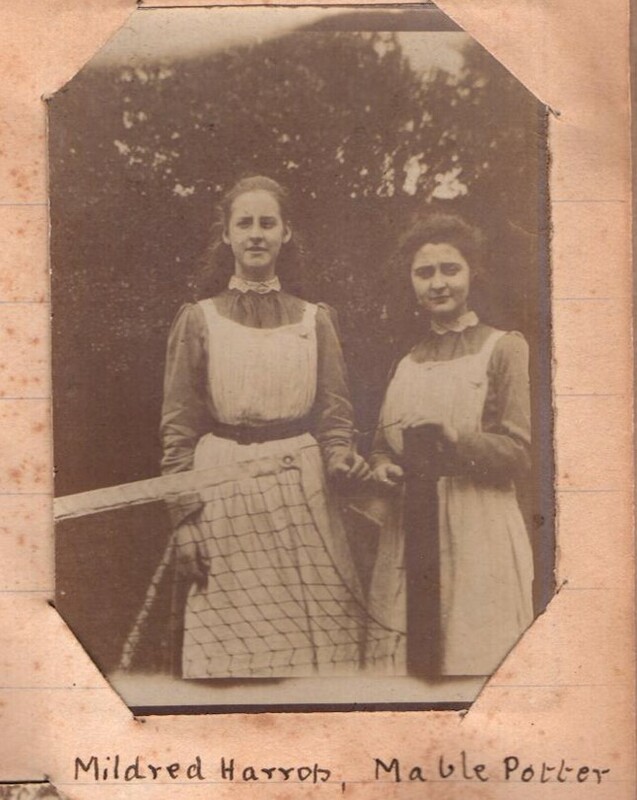 Unfortunately, most of these photographs have faded badly and none are identified but they do capture scenes of the school at Clapham and some girls of the period. Mildred Harrop became the first headmistress of the Junior School when it became a separate establishment in 1918. In 1910 she became a student at University College, London to study for a degree in Modern Languages on a scholarship awarded by the Drapers’ Co. In 1915 she rejoined the School as assistant mistress and just three years later became Junior School headmistress, a post she remained in until 1946. The Junior School, situated in Weybridge, Surrey, was ‘evacuated’ back to the main school at the outbreak of war in 1939 and it was Mildred who kept the spirit of the Junior School alive throughout that period. 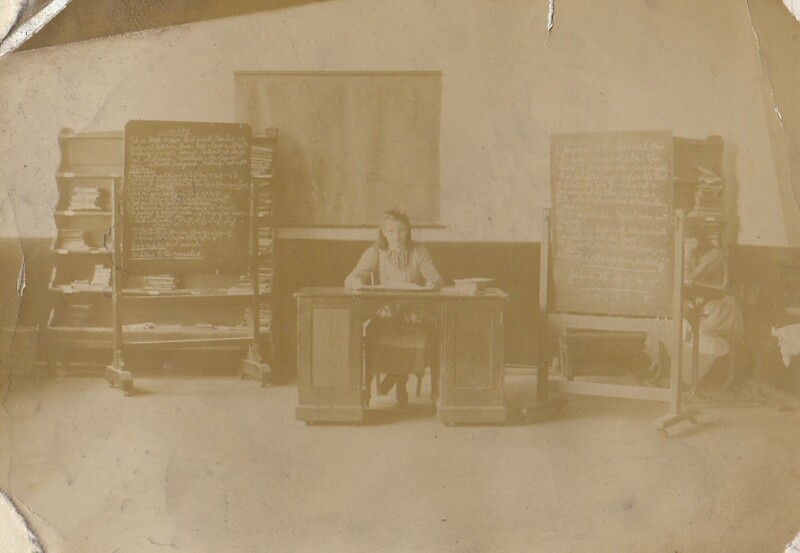 A 1941 curriculum indicates that she taught Scripture, some History, Verse speaking and Reading. The Juniors having returned to Weybridge post-war, Mildred handed over the reins to Isobel Vaughan and took retirement. Mabel Potter (although Ethel spells it Mable) was the Gold medallist of 1906. She left in 1907 but became a pupil teacher at the School until 1909. At this point she became a salaried teacher at the School and she remained with RMSG her whole career. In 1918 she is recorded as a Form Mistress of VB and in 1929 as Form Mistress of VA. (VB and VA are not explained as whoever wrote this knew exactly what was meant. It is probably one of the more senior forms with girls of about 15-16 years of age.) By 1939 she was recorded as a resident teacher of French and Latin and she had been Second Mistress (equivalent of Deputy Headteacher) to Bertha Dean from 1932. After Bertha Dean’s retirement, and Miss Calway came and went in a short space of time, swept off her feet by the School Chaplain whom she married in 1940, Mabel – ‘Little Miss Potter’ – became the Acting Headmistress until the appointment of Miss Fryer in 1941. She finally retired in 1945, just a year before her friend Mildred, and went to live in East Sussex where she continued to live until her death in 1978. 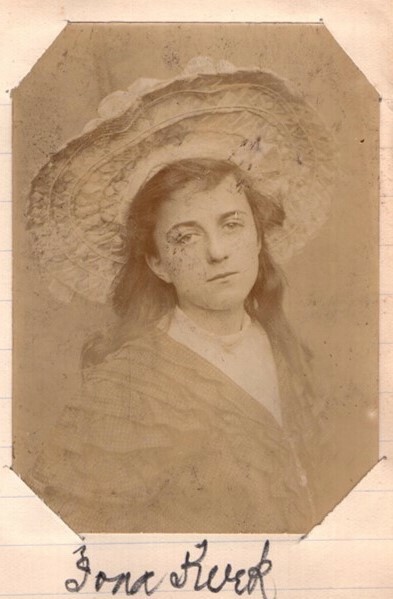 Ethel, our intrepid photographer, not only identified most of her subjects at the time but some she must have identified much later in life as the handwriting is distinctly different. It is an example of the far-reaching memory many of our Old Girls demonstrate, being able (for example) to recall all their school numbers for many decades after they had left and such numbers ceased to have meaning. As the days of the selfie were far off, Ethel must have allowed one of her friends to use the camera because we have a photo she has labelled of herself. 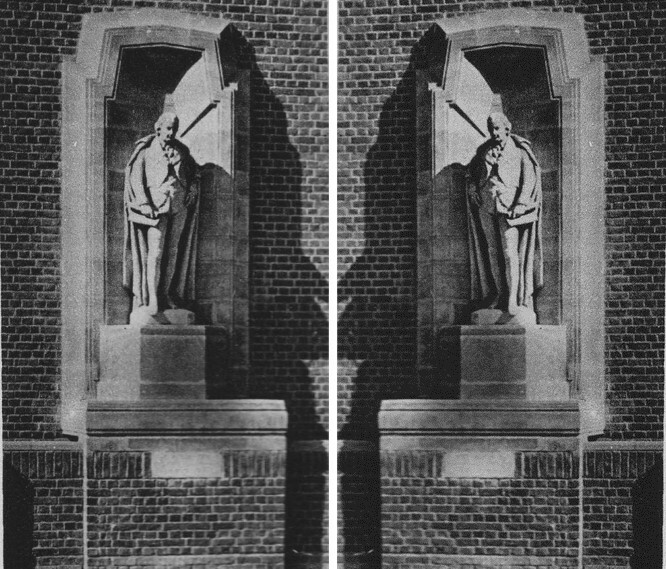 Although it is not known exactly where in school this image was taken, we can see the cream banding on the brickwork which was a part of the design of the School at Clapham. And it rather looks as if she is modelling the same fetching hat that Iona is also wearing! We have no idea what kind of camera Ethel or Alice used but it seems very likely that it was the ubiquitous Box Brownie. 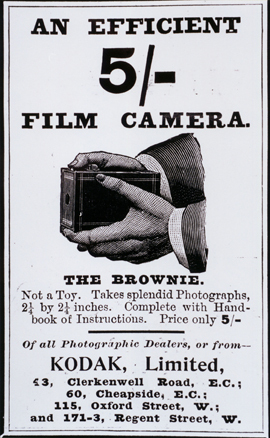 “The Brownie camera, introduced in February 1900, invented low-cost photography by introducing the concept of the snapshot to the masses.” (Wikipedia) This was a camera developed by Eastman Kodak, invented by Frank A. Brownell, and given its name partly for its inventor and partly for the brownies in popular Palmer Cox cartoons of the time. Palmer Cox was a Canadian illustrator and author and his Brownies were “mischievous but kindhearted [sic] fairy-like sprites” (Wikipedia) which appeared in a series of humorous verse books and comic strips. Box Brownies, as a marker in the development of photography, are regarded as so important that they make it into the BBC/British Museum’s History of the World in a 100 objects. They were particularly marketed for children possibly in the same way as Hygena QA furniture (for those of us who remember it! ), the first self-assembly kitchen units deemed to be so easy to construct that a child of six could do it. “The Company’s TV advertising used a little girl to demonstrate simplicity of assembly” (Wikipedia). And there were many of us who, having started some self-assembly units, longed for a handy child armed with a screwdriver to come to our rescue! But back to the Box Brownie and its ease of operating. 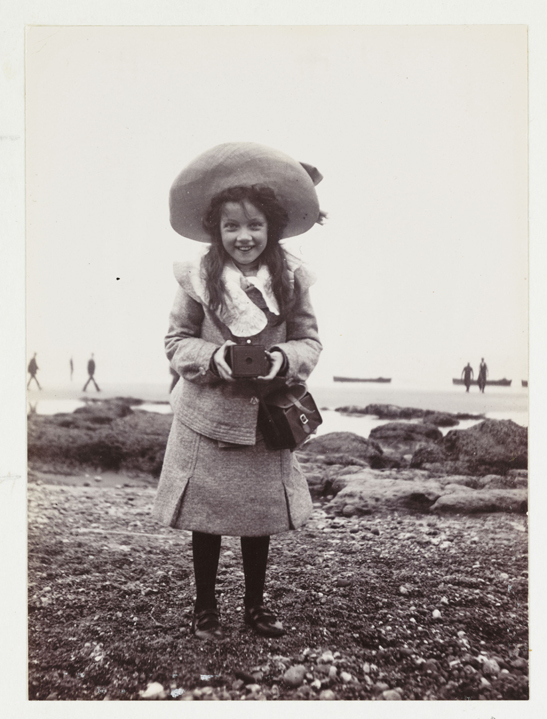 This image, dated to 1905, showing a young girl using a Box Brownie, is from https://blog.scienceandmediamuseum.org.uk/a-z-photography-collection-b-is-for-brownie/ and is probably taken, somewhat ironically, by a professional photographer with a far superior camera to a Box Brownie. Perhaps Alice Kent used the same flour bin. Indeed, she may even have been one of the friends sitting on its lid whilst Ethel got to work on her photographs. If so, it is remarkable that we have two sets of photographs not only taken by young photographers but the images developed by them too. And all this before WWI. It took nearly ninety years more for photography, in its modern format, to become established as part of the School syllabus as a Sixth Form subject. 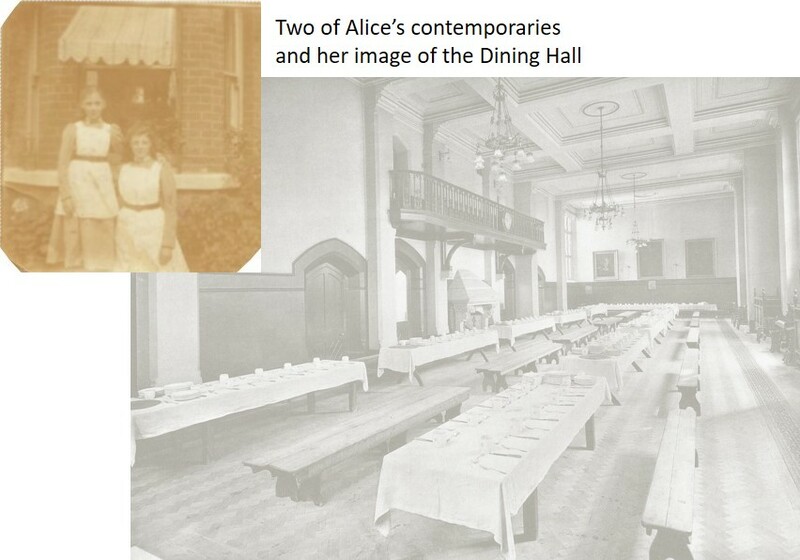 Alice’s photographs in her album may be fading badly, Ethel’s slightly better preserved, but both are now secured in digital format and both are a tribute to the pioneering spirit of earlier pupils.